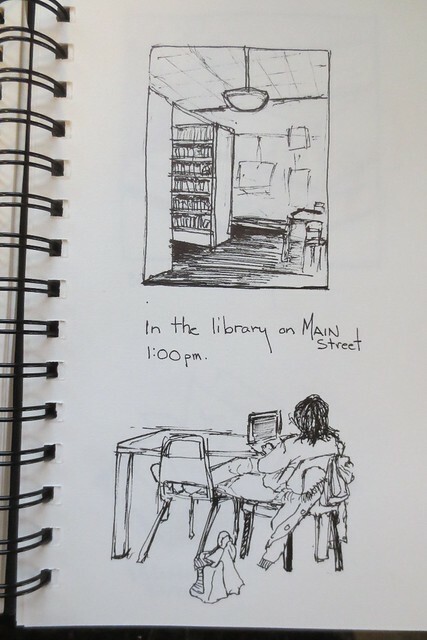 A very cold day out in Wisconsin brought us indoors for sketching on the World Wide SketchCrawl. The cold kept people away but there were still places to sketch indoors downtown on Main Street. I did mine from the Coffee Studio and the Portage County Library. With warmer weather in the Spring, the next SketchCrawl should draw more participants. This forum is fun to be a part of and to see all of the creative sketches across the world. I am glad to be a part of it once again while sharing these sketches. 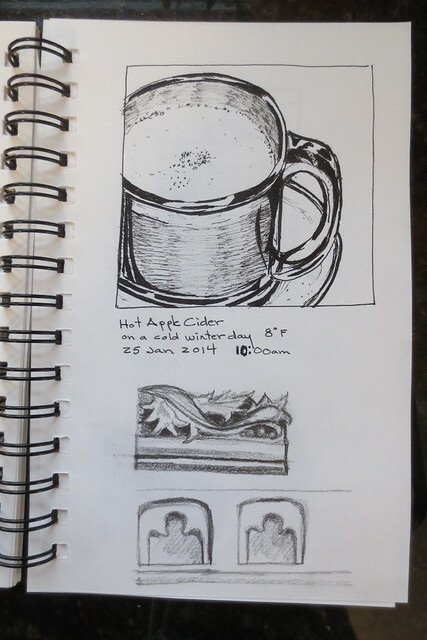 Starting with a warm cup of cider on this cold day, it was necessary to sketch it first before it disappeared with comfort. The building details on Main Street buildings are so interesting to view from the window of the Coffee Studio. On to the library, I sat looking over at other patrons, one especially relaxed with feet raised and working on a laptop. A library is an odd sort of place with so many stacks of books and media. 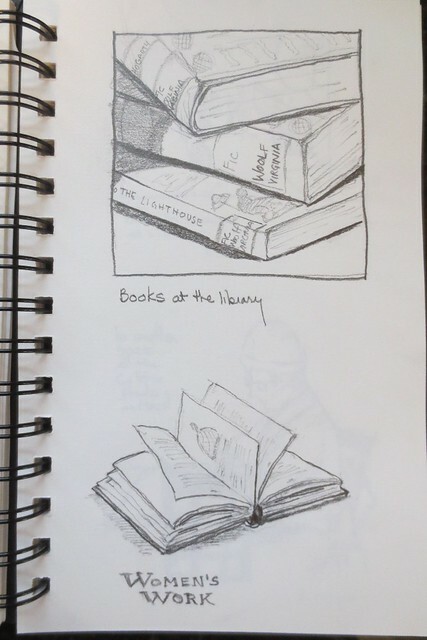 So many books, I had to sketch a few. I ended up checking out one to take with me: Virginia Woolf's "A Room of One's Own." It brought back many memories of being in London this past Fall Semester and visiting Virginia's family home on Gordon Square, (now School of Arts, Birkbeck, University of London in Bohemian Bloomsbury http://www.bbk.ac.uk/arts/about-us/our- ... rts-spaces) where many times I stood looking out the front windows and imagined Virginia watching people ambling along the street and in the park area. Part of it was also the home to the celebrated economist John Maynard Keynes after Virginia moved south to Sussex. And back to the Coffee Studio for another afternoon sketch before calling it a day. The snow is all around on the streets, reaching up to cover the street benches and any bicycles that have not been retrieved at the stands. Amazing how hardy people can be while still out on their bikes in this Wisconsin January snow. A splendid day, indeed, out on the 42nd World Wide SketchCrawl. Just found out one of our group from Central Wisconsin was down in San Miguel de Allende, Mexico during this time. Perhaps she was able to meet up with other sketchers in the square or saw them out in town? I'm glad you found warm spots for your sketch crawl. 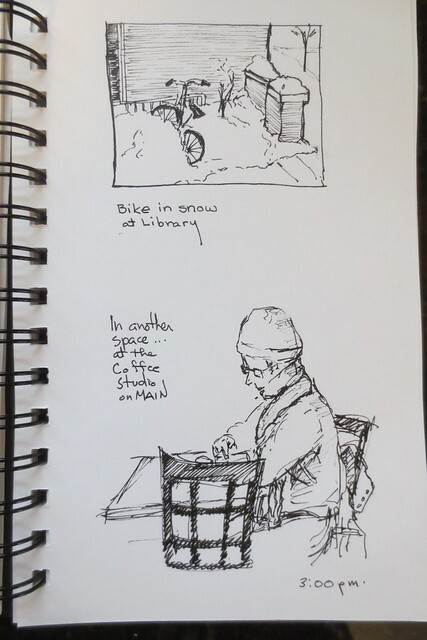 I love seeing the bike in the snow and the comfy library patron! Thanks for sharing your work.